Originally given as a talk at the University of Notre Dame in 1979, the following essay was published in Liturgy and Social Justice, ed. Mark Searle, Collegeville, MN: Liturgical Press, 1980, 36–52. It is reprinted with the kind permission of the Maryland Province of the Society of Jesus. The trouble seemed to be over; the forty-or-so demonstrators moved from church to street and the liturgy opened. But the preceding was only a prelude. The homilist, head of the Spanish Secretariat of the archdiocese, appeared in symbolic purple. Instead of the usual eulogy, he quoted statements by John Paul II and the bishops of Latin America about repression, torture, and disappearances, about the attempt of governments to justify such activities on the basis of national security. He began to focus on the people who had vanished under the Videla regime and quoted Scripture on Herod’s slaughter of the innocents. The scene at St. Matthew’s provides a stirring context for my address; perhaps it will put teeth into it. You see, the title thrust upon me is deceptive. What could be less threatening, more pacifying, than the sleepy subject “Preaching the Just Word”? In point of fact, as the Argentinian incident demonstrates, there are three “sleepers” here: the first is theological, the second liturgical, the third homiletic. The theological question: Does a Church committed to eternal salvation have anything to do with everyday justice? The liturgical question: If the Church has a role to play in the area of justice, how can this possibly affect the liturgy? The homiletic question: If justice does enter the liturgy of the worshiping community, should the preacher preach it—and if so, how? My first question is theological: Does a Church committed to eternal salvation have anything to do with everyday justice? The question is basic, for unless we address that issue, there is no point in asking the next two questions: How does justice enter the liturgy? How do we preach justice? To get concrete, should the Church speak out on economic injustice, on the fact that at this moment at least 460 million people are hungry? Should the bishops of Chile have criticized their government in 1974 “for violating human rights, creating a climate of insecurity and terror. . . .“? Should Bishop Donal Lamont have castigated the Rhodesian regime for racial discrimination and repression? Should the Church take a position on the Vietnam war, on California lettuce or Farah slacks, on capital punishment or the Panama Canal, or ERA or federal aid for abortions? I give these examples simply as examples, not to debate the merits of any of them; for these are complex issues. My question is broader than any example. Does the Church, precisely as a Church, have a mission that includes justice and human rights? Does the Church have a role to play in the social, political, and economic orders? Many Christians, many Catholics, shout a resounding no. As they see it, the Church, as a Church, has no commission to right human injustice. The Church is a spiritual institution, and its mission is sheerly spiritual: it is a channel that links the human person with God. The Church’s charge is to help us know, love, and serve God in this life and to be happy with him forever in the next. Oh yes, poverty and politics, injustice and inhumanity, may stand as barriers to God’s grace. If they do, then the Church must struggle against them—but not as a direct facet of its mission, only as obstacles at the outer edge of its vocation. The Church’s commission is to gather a band of true believers who will prepare themselves by faith and hope for the redemptive action by which God establishes his Kingdom at the end of history. Against such a privatized, me-and-Jesus religion the best of Catholic tradition cries out clearly, at times in anger. Papal encyclicals, from Leo XIII’s Rerum novarum (on the rights and obligations of workers, employers, and the state) to John Paul II’s address at Puebla and his first encyclical (Redemptor hominis), give the lie to such a thesis. No, the Eucharistic signs and symbols do not of themselves change social, political, and economic structures; but they should change 700 million hearts and minds, grace them to admit the oppressions of which they are victims and for which they are responsible, inspire them to work with others for the coming of a kingdom characterized by justice and love. On the other hand, any program of evangelization is inadequate if the Church doesn’t spend itself to free the human person from every inhuman shackle. Oh yes, the Church has good news to preach even to those whose situation is humanly hopeless; for the good news is Jesus—Jesus alive, yearning to make those who are heavy-burdened one with him. Sanctity is possible in poverty-ridden Appalachia, in the political prisons of the Philippines, in the excrement of Calcutta. But this does not exempt the people of God from the ceaseless struggle to transform the city of man into the Kingdom of God—a Kingdom of peace, of justice, of love. Christ’s redemptive work, while of its nature directed to the salvation of men and women, involves also the renewal of the whole temporal order. The Church has for mission, therefore, not only to bring to men and women the message of Christ and his grace, but also to saturate and perfect the temporal sphere with the spirit of the gospel. . . . The two spheres [spiritual and temporal], distinct though they are, are so linked in the single plan of God that he himself purposes in Christ to take up the whole world again into a new creation, initially here on earth, completely on the last day. Human dignity is rooted in the image and reflection of God in each of us. It is this which makes all persons essentially equal. The integral development of persons makes more clear the divine image in them. In our time the Church has grown more deeply aware of this truth; hence she believes firmly that the promotion of human rights is required by the gospel and is central to her ministry.
. . . for there is a kind of “injustice that assumes institutional shape,” and as long as this obtains, the situation itself calls for a greater degree of justice and demands reforming. Our contemporaries are no longer convinced that social structures have been predetermined by nature and therefore are “willed by God,” or that they have their origin in anonymous evolutionary laws. Consequently, the Christian must ceaselessly point out that the institutions of society originate also in the conscience of society, and that men and women have moral responsibility for these institutions. We may argue how legitimate it is to speak of “institutional sin” or of “sinful structures,” since the Bible speaks of sin in the first instance terms of an explicit, personal decision that stems from human freedom. But is unquestionable that by the power of sin injury and injustice can penetrate social and political institutions. That is why . . . even situations and structures that are unjust have to be reformed. Here we have a new consciousness, for in the past these responsibilities could not be perceived as distinctly as they are now. . . . So far, so good: the struggle for justice is an indispensable facet of the Church’s mission. But the theological question leads to the liturgical question: Granted that the Church has a vital role to play in the area of justice, how can this possibly affect the liturgy? On principle, it should. As sacramentum fidei, sacrament of Christian belief, liturgy has a twin function: exprimit and causat. Liturgy should give expression to the faith-experience of the Christian people, and liturgy should mold that experience. All “liturgies” express experience and mold it: country music in Nashville, professional and college football, marching bands and the New York City Ballet, the Nazi goose step and the Aztec Two Step. . . . This is what expresses and evokes the joys and frustrations of a people, their anger and violence, their loves and their hates, their pent-up emotions. If we accept the thesis of first-rate liturgiologists that Christian liturgy sacramentalizes what goes on in the rest of our lives, that the liturgical journey ritualizes the human journey, two questions challenge us: (1) In point of fact, does this liturgy express the faith-experience of this people? (2) If it does, how Catholic is that expression? The dimensions of this problem, its dangers, were brought home to me in an article by Brian Wickler. [The liturgical] revival [among organized Christians] had a good side—in that it stimulated mature and scholarly thought about the fundamentals of Christianity and an understanding of the depths to which secularization had gone. But it had a bad side too—the side that made it possible in some places for the Christian liturgy inside the church and the fascist liturgy outside the church to coexist, or even at times to cooperate with each other. The liturgical revival was, in its origins, a conservative or even reactionary movement, liable at times to delusions of grandeur. This gave it a certain sympathy for the trappings of fascism and made the essential atheism of the latter hard to nail down. It is perhaps not surprising that those Christians most opposed to Hitler were often those least touched by new liturgical ideas—either intellectual protestants like Dietrich Bonhoeffer, or simple tridentine-formed peasant-Catholics like Franz Jägerstätter. Neither is it surprising that many post-fascist secular theologies of Europe and America (including those developed under Catholic auspices) have today turned away from liturgy as a source of inspiration or hope, or have even give it up as a bad job altogether. Does it frighten you that the liturgy in a Catholic cathedral is expected to coexist with, perhaps even cooperate with, the fascist liturgy that is Argentinian repression? Does it bother you that in liturgizing, ritualizing, sacramentalizing a nation’s experience, we are expected to limit our symbols to the love of God? In his challenging book The Eucharist and Human Liberation, Tissa Balasuriya insists that since Eucharistic worship is at the center of Christian life, the Eucharist must affirm and promote the biblical imperative of human liberation. But, he finds, almost without exception the Eucharist has been a place where the oppressor joins the oppressed with impunity; the Eucharist has been used in cooperation with, and support of, colonizing powers; even today liberating movements do not find affirmation in Eucharistic worship. Whatever the defects of the book, however utopian its hopes, it compels us to ask a crucial question: How is it possible to celebrate Eucharist if it is not expressing the real oppressions of our people, if it is molding a faith that liberates from enslavements? My thesis is that the celebration of the risen Christ by the assembly of believers is one of the most effective political actions that men can perform in this world—if it is true that this celebration, by contesting any power system which oppresses mankind, proclaims, stirs up and inaugurates a new order in the world. Here “politics” is used to describe “that exercise of power which controls public welfare and progress.” But how does the liturgy influence public welfare and progress? On the face of it, few actions seem less political than liturgy. Totalitarian regimes hostile to the Church “begin by forbidding Christians any form of self-organized action in society; they then prohibit or supervise religious instruction and preaching; but in general they allow worship as inoffensive.” The issue is highly complex; time forces me to simplify, and to simplify is, in a sense, to falsify. Paradoxically, it is not primarily by introducing political themes, by inserting an ideology, that the liturgy becomes a social force. I am not disparaging the Mass of Protest in Latin America or the Mass for Peace in the Roman Missal; I have been moved by liberating readings from Exodus and the prophets, by “prayers of the faithful” that cry to heaven for bread and justice. I mean rather that there is a serious danger in a “celebration which tries to be political but relies more on an ideology than on the paschal dynamics of the Christian mystery”; it “very soon becomes a politicized liturgy: that is, one used for specific political ends.” This can mean a form of manipulation at odds with the essential nature of liturgical action. The liturgy does not of itself make Christian Democrats or make for constitutional amendments; it is not a substitute for sociology, economics, or political science. And yet, as George Higgins argues, “it is still the Mass which matters most—even in the temporal order.” But the liturgical action effects change above all by its own inner dynamic. Why? Because the temporal order can be changed only be conversion—only if men and women turn from sin and selfishness. And for Catholics the primary source of conversion is the sacrifice of the Mass, which extends through time and space the sacrifice of the Cross through which the world is transfigured. The Mass should be the liberating adventure of the whole Church, the sacrament that frees men and women from their inherited damnable concentration on themselves, looses us from our ice-cold isolation, fashions us into brothers and sisters agonizing not only for a Church of charity but for a world of justice. The problem is not whether there is a link between liturgy and liberation. The problem is that we do not allow the liturgy to liberate—even to liberate us. So much for the theological question, so much for the liturgical question. The struggle for justice is an indispensable facet of the Church’s mission, and the liturgy would express and mold this facet of human experience. Now for the stickiest issue of all, the homiletic question: Should the preacher preach justice—and if so, how? The more general question—should I preach justice?—ought not detain us, much less paralyze us. The specific function of the homily, Yves Congar has pointed out, is not only to explain the liturgical mystery but to bring the faithful into the mystery “by throwing light on their life so that they can unit it to this mystery. When this happens, the sermon is truly a word which prompts a response.” You see, the liturgy’s insights “are more or less veiled”; liturgical texts and forms tend to be immobilized, with rare exceptions are the same for all, whatever their condition. The homily extends the immemorial symbols to a particular time and place, a particular people. And so I must speak to this people’s needs, this people’s hungers. If they need to act justly or if they hunger for justice, a liturgy that expresses and molds their faith-experience forbids me to keep silent. To say nothing is to say something. But what do I say? How concrete dare I get? For some, the priest simply preaches the gospel, the word of God, teaches what Jesus taught. Preach the word of God and parishioners will make the right decision in the moral order. In a word, limit yourself to general principles. Making this world more just means, among other things, . . . to strive to have a world in which no more children lack sufficient nutrition, education, instruction; . . . that there be no more poor peasants without land . . . no more workers mistreated . . . no more systems which permit the exploitation of man by man or by the state . . . no more who have too much while others are lacking everything through no fault of their own . . . no injustice or inequality in administering justice; . . . that the law support everyone equally; that the force not prevail over truth and rights . . . and that the economic and political never prevail over the human. At the beginning of his journey to Latin America, John Paul was not mouthing pious abstractions; he was addressing actual life-and-death issues. Second, homilies that avoid concrete applications risk saying nothing. The Old Testament and the New are indeed our Bible, the privileged source of our faith and our morality. But if I mount the pulpit with “Scripture alone” in my hands, if I limit my preaching to the broad biblical imperatives, if I simply repeat scriptural slogans like “Man does not live on bread alone,” “My peace I give to you,” “Seek first the kingdom of God,” “Love your neighbor as you love yourself,” “Wives, be subject to your husbands,” hungry stomachs will stay bloated, the arms race will escalate, dissidents will rot in political prisons, blacks will return to their slavery, and women will continue to be second class citizens in much of the world. After all, it is not only heathen who are responsible for oppression; the oppressors, large and small, often break Eucharistic bread with us. In fact, who among us is not, by act or silence, an oppressor of our brothers and sisters? Beyond that, our delicate, indispensable task is to help form Christian consciences—not force them, form them. No, the gospel much be touched to concrete human living. And remember, the Church grows—the whole Church, pope as well as peasant—in its understanding of what the gospel demands. For example, in its efforts to construct livable, viable, social order, the Church has consistently stressed three facets of human living: truth, justice, and love. Only within recent times have these principles of social order been finally rounded out with a fourth principle indispensable in our days. I mean freedom. It is the growing realization that truth, justice and love are not enough, are not really there, if the man and woman they serve are not free. It is this that must be preached—our fresh understanding of what the perennial gospel demands or suggests in the context of our time and space. The magisterium does it (see Mater et magistra and Populorum progressio); the institutional Church need not, should not, and does not regard itself, in Karl Rahner’s words, “solely as the doctrinaire guardian and teacher of abstract principles which become increasingly abstract and are liable to carry within themselves the danger of a terrifying sterility. . . .” The Church has and should have the courage for concrete imperatives, concrete directives, “even in regard to socio-political action by Christians in the world.” This same courage the preacher must carry to the pulpit. But the neuralgic problem remains: How concrete dare I get? There is no simple solution, no all-purpose push button to activate the answer. Each issue calls for blood, sweat, and tears. At times the issue is clear. In 1964 I simply had to endorse the Civil Rights Act; there was no alternative, save the enslavement of a race. But few political and socioeconomic issues are that clear-cut. Once you get beyond the general principles—the right to live and eat and work, the right to education and health care, the right to decent housing—it is difficult to locate the evil, to identify the villain, to pinpoint the solution. I can indeed proclaim from the pulpit today what the United Nations World Food Conference proclaimed from Rome in 1974: “Every man, woman, and child has the inalienable right to freedom from hunger and malnutrition. . . .” But the causes are confoundingly complex. Is nature the villain—“acts of God”? Is it people—the world growing too fast? Is it productivity—lack of agricultural know-how? Is it our international economic order—a whole web of unjust relationships between rich and poor countries? Experts, men and women of good will, disagree. But disagreement need not strike me dumb. It can only render me mute if I see the pulpit as the podium for eternal verities alone, defined dogma, the ipsissima verba of Jesus. Beyond that, our delicate, indispensable task is to help form Christian consciences—not force them, form them. Help form Christian consciences—this is the crucial phrase, with each word of high significance. I am not an expert on world hunger and defense budgets, but without playing partisan politics I can at least wax as indignant as World Bank President Robert S. McNamara when he denounces an arms race that costs the nations more than 400 billion dollars a year, while over a billion men, women, and children live in inhuman degradation, condemned to stunted bodies, darkened minds, shortened lives. I do not know the political solution; I cannot fashion a budget; but I do know that those horrifying figures add up to a moral evil. Given that moral evil, how can I fail to echo the cry of HEW Secretary Joseph A. Califano, Jr., at Notre Dame’s commencement: “Of all the judgements of history and God we should fear, it is their judgement on our continued failure to use the means at hand to end the hunger of the world that we should fear most”? This much at the very least God’s people can expect of me: in the midst of my mind’s chaos, a cry from the heart. But what if I am convinced I do have the answer? The answer to the arms race is unilateral disarmament; to abortion, a constitutional amendment; to the parochial-school crisis, tax credits; to capital punishment, life imprisonment; to feminine enslavement, the ERA; to migrant-worker injustice, a boycott of grapes and lettuce; to Rhodesia, economic sanctions. These are indeed moral issues, but may I preach my own solution in the name of the gospel? Of all homiletic minefields, this may well be the most perilous. I shall move quickly and warily, aware that each step could trigger an explosion. I do not see how you can bar the controversial from the pulpit simply because it is controversial. After all, I cannot be content with glittering generalities; I must move the gospel to this age, to this people, but the meaning and demands of the gospel today are chock-full of complexity. And the more complex an issue, the more open to controversy. With Peter Henriot and George Higgins, I submit that “the pulpit, as a general rule, is not the proper forum in which to pontificate on complicated and highly controversial political and socio-economic issues.” Here the crucial word is “pontificate.” On such issues, in a short span of time, with no room for counterargument, I dare not speak in dogmatic fashion, as if I alone am the trumpet of the Lord. If I dare not dogmatize, I may still raise the issues, lay them out, even tell people where I stand and why—not impose my convictions as gospel, but to quicken their Christian conscience, to spur them to personal reflection. I may not take unfair advantage of a captive audience, especially since the expertise in the pews often exceeds my own. Inasmuch as the suffering faithful, however sorely provoked, are expected by immemorial custom to hold their tongues as I empty my quiver against the ERA, I should provide another forum—parish hall, smaller discussion groups—where controversial issues may be properly debated, where all who wish to speak their piece may be heard. I must guard against a persistent priestly peril, where I see the ordained minister as alone bearing the burden of Christian guidance and pastoral counseling. No, all of us are in this together; all of us, pope included, belong to an ecclesia discens, a Church that is learning. I am afraid that too often our preachers entirely ignore what we, the silent faithful, expect to hear in a sermon. . . . They address us as rebels whom they must subdue; as idlers whom they must shake up; as hardened sinners whom they must needs terrify; as the proud who require to be humiliated; as the self-satisfied who need to be disquieted. . . . [They] are never done telling us of our duties and of our neglect of duty. . . . But if you come to examine it, there is really nothing easier than to put forward a person’s duty; and to hand out reproaches costs nothing either. . . . The thing which is really difficult, which is actually divine, is to give us a taste for our duties, and to awaken in us a wish to do them and to be generous in the doing. And another name for a taste for duty is love. Beloved preachers, then, make us love God, or rather, help us to believe in his love for us. Those striking words troubled me from the moment I discovered them, especially the last several sentences: the divine thing “is to give us a taste for our duties. . . help us to believe in [God’s] love for us.” Unexpectedly, that entreaty brought me back from the homily proper to the broader liturgy, from the homilist homilizing to the celebrant celebrating. For in this context of the just word, a Jesuit colleague at the Woodstock Theological Center in Washington, John C. Haughey, recaptured for me a remarkable insight expressed by government people engaged in a Woodstock project on government decision-making. As they saw it, good liturgy facilitates public responsibility not because it provides principles of solution, not because it tells the people what precisely to think about specific conflicts, but rather because a celebrant who effectively celebrates the transcendent puts them in touch with that which transcends all their burning concerns, their particular perplexities. Good liturgy frees them to sort out the issues that they have to decide, because it makes them aware of their addictions and their illusions, casts a pitiless light on the myopic self-interest, detaches from a narrow selfishness, facilitates Christian discernment. In that sense liturgy is not so much didactic as evocative. Let God transpire; let God speak. Can they feel that I get angry, that I cry, that I beat my fists against a wall in frustration, that I shout out to God against his own seeming injustice? Or do they feel that in my case “the just word” is just a word and nothing more? A distressing question has taken hold of me and will not leave me: Is it possible that in my understandable yearning to link liturgizing to justice and human rights, I have been saying too much and celebrating too little? I once heard a preacher who sorely tempted me to say I would go to church no more. . . . He had lived in vain. He had no one word intimating that he had laughed or wept, was married or in love, had been commended, or cheated, or chagrined. If he had ever lived or acted, we were none the wiser for it. The capital secret of his profession, namely to convert life into truth, he had not learned. Not one fact in all his experience, had he yet imported into his doctrine. . . . Not a line did he draw out of a real history. The true preacher can always be known by this, that he deals out to the people his life,—life passed through the fire of thought. It is understandable that our people hear no word from us intimating that we are married or “in love.” It passes understanding that our people rarely sense from the homiletic word that our hearts are in anguish because Christians are murdering Christians in Northern Ireland, because ten million Americans go to bed hungry each night, because human rights are bloodied in South Africa, because two hundred thousand homeless humans have to defecate at curbstones in Calcutta, because on my street there are people who are lonely or hungry or scared. Can they feel that I get angry, that I cry, that I beat my fists against a wall in frustration, that I shout out to God against his own seeming injustice? Or do they feel that in my case “the just word” is just a word and nothing more? At this point I am speechless. After three months of relentless research and reflection, after mountains of paper and a million words, after fifty-six minutes of close reasoning and impassioned argument, what I put to you most urgently on preaching the just word goes beyond the word that is preached. I phrase it in two questions. (1) Do you live the just word you preach? Are you, as St. James put it, a “doer” of the just word, “a doer that acts” (Jas 1:22-25), or do you simply speak it? Does your just word leap forth from some experience of our sorry human condition? Is it your life that passes through the fire of your thought? (2) How do you celebrate the just word, the Word who is Justice? Do the faithful sense that it is your body too that is being offered for them, your blood too that is being shed for them? From your celebration of transcendence, do they experience the God who enables them to “execute justice”? Father Walter J. Burghardt, SJ (1914–2008) taught historical theology for 32 years at Woodstock Theological College, and was a professor at Catholic University and a visiting lecturer at Union Theological Seminary and Princeton Seminary. 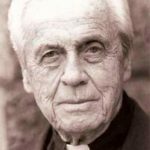 A prolific writer, renowned preacher, and devoted ecumenist, Fr. Burkhardt authored more than 25 books and 300 articles, and served for 23 years as editor-in-chief of the Journal Theological Studies. He also founded and directed Preaching the Just Word, a project of the Woodstock Theological Center. The Beecher lectures on preaching, which he delivered at Yale Divinity School in 1994, were collected and expanded into a book published by Yale University Press in 1996. See the Washington Star, May 26, 1979, D-1 and D-2; quotation at D-2. T. Howland Sanks, S.J., and Brian H. Smith, S.J., “Liberation Ecclesiology: Praxis, Theory, Praxis,” Theological Studies 38 (1977) 24. George G. Higgins, “The Church and Social Concerns,” syndicated column, excerpted from One Voice (Diocese of Birmingham, Ala.), April 27, 1979, 4. As cited by Higgins, ibid. Pius XII, Allocutio ad cultores historiae et artis, May 9, 1956 (AAS 48  212). Apostolicam actuositatem, no. 5; see also no. 7. In response to this quotation, one might dredge up the affirmation of Gaudium et spes, no. 42: “Christ, to be sure, gave his Church no proper mission in the political, economic, or social order. The purpose which he set before it is a religious one. . . . “ Here the crucial terms are missio propria and finis . . . ordinis religiosi. Discussion these phrases is not possible here, but two observations seem in order. (1) GS 42 is not excluding the Christian community from playing a significant, transforming role in the social, economic, and political orders. Such an interpretation would make nonsense out of Part 1, chapter 4. The text reaffirms the legitimate autonomy that belongs to the temporal order. For the historical background of this chapter (nos. 40–45) and an insightful presentation of its meaning, see Yves Congar’s chapter “The Role of the Church in the Modern World,” in Hebert Vorgrimler, ed., Commentary on the Documents of Vatican II 5 (New York: Herder and Herder, 1969) 202–23. For example, “The Church’s function comprises everything human. . . . Consequently the Church must not be restricted to a ‘religious’ domain, identical in practice with public worship” (213). (2) There is a problem on what “Church” means in chapter 4. Charles Moeller argues, from the proposed amendments, that whereas in chapter 1 to 3 it means “the People of God,” in chapter 4 it refers to the hierarchy (ibid., 61–62). Congar (ibid., 211 and 214 [see n. 28 for pertinent relatio]), without alluding to Moeller’s position, says the Church in chapter 4 is “the People of God,” “the social body.” The difference in interpretation of “Church” is obviously not irrelevant to one’s understanding of the Church’s mission. 1971 Synod of Bishops, De iustitia in mundo (Vatican Press, 1971), Introduction, p.5. One may argue whether “constitutive” in the document means “integral” or “essential” (the 1976 document of the International Theological Commission, “Human Development and Christian Salvation,” trans. Water J. Burghardt, S.J., Origins 7, no. 20 [No. 3, 1977] 311, states that “it seems more accurate to interpret [ratio constitutiva] as meaning an integral part, not an essential part” [IV]—a discussable affirmation). What is beyond argument is that the Synod saw the search for justice as inseparable from the preaching of the gospel. 1974 Synod of Bishops, “Human Rights and Reconciliation,” Origins 4 (1977) 318. “Human Development and Christian Salvation” IV (translation in Origins 7  310–11). For careful appraisal of “what the Old and New Testaments have to say about the relationship between salvation and human welfare, between salvation and human rights,” see the document of the ITC (n. 9 above), III (translation in Origins 309–10). See also The Social Message of the Gospels, ed. Franz Böckle, Concilium 35 (New York: Paulist Press, 1968). Address of Pope John Paul II opening the deliberations of the Third Assembly of Latin American Bishops, Puebla, January 28, 1979, III, 2. An English translation is available in Origins 8, no. 34 (Feb. 8. 1979) 530–38; but I have not used it for the passage quoted, because it translates indispensable as “essential” (536), apparently unaware of the problem to which I allude in n. 9 above. I take it that the Pope and/or his speechwriter consciously avoided a philosophical interpretation of the 1971 Synod’s ratio constitutiva; it is enough that a facet of the Church’s evangelizing mission be described as something that the Church may not refuse to do; it is not capable of being dispensed with; the Church cannot be released from this obligation. The Pope goes on to cite Paul VI’s Evangelii nuntiandi, no. 29: “evangelization would not be complete if it did not take into account the unceasing interplay of the Gospel and of man’s concrete life, both personal and social” (Origins 536). On this see my “A Theologian’s Challenge to Liturgy,” Theological Studies 35 (1974) 233–48, at 240–44. Brian Wicker, “Ritual and Culture: Some Dimensions of the Problem Today,” in James D. Shaughnessy, ed., The Roots of Ritual (Grand Rapids: Eerdmans, 1973) 17. See also George G. Higgins, “The Mass and Political Order,” Proceedings of the Liturgical Conference, Worcester, Mass., August 1955: “Shortly after World War II an extremely well-informed German priest told me, on what I am prepared to accept as reliable evidence, that the Nazis, far from being worried about the pre-war growth of the liturgical movement in Germany, secretly encouraged it. According to my informant, they felt that an intense preoccupation with the liturgy would serve to distract the attention of Catholics and make them less inclined to engage in political action. Whether this report is accurate or not, the record will show, I think, that some of those most actively engaged in the liturgical movement not only in Germany but in other countries as well did make the mistake of ignoring political and social problems or, even worse, of at least passively favoring political programs which they should have actively opposed” (130–31). Tissa Balasuriya, O.M.I., The Eucharist and Human Liberation (Maryknoll, N.Y.: Orbis Books, 1979). Joseph Gelineau, “Celebrating the Paschal Liberation,” in Politics and Liturgy, ed. Herman Schmidt and David Power, Concilium 92 (New York: Herder and Herder, 1974) 107. Gelineau, “Celebrating the Paschal Liberation,” 107. Higgins, “The Mass and Political Order,” 133. Yves Congar, O.P., “Sacramental Worship and Preaching,” in The Renewal of Preaching: Theory and Practice, Concilium 33 (New York: Paulist Press, 1968) 60. See ibid., 55–56; also my “The World Made Flesh Today,” New Catholic World 221 (1978) 116–25, at 122. See Socrates, Church History 6, 18; Sozomen, Church History 8, 20. John Paul II, Homily, Mass in Independence Plaza, Santo Domingo, Jan 25, 1979 (Origins 8, 34 [Feb. 8, 1979] 543). I am aware that the Pope does go on to speak of a “more divine world” as well, “the vertical orientation of evangelization” (ibid.). Karl Rahner, S.J., The Shape of the Church to Come (London: SPCK, 1974) 77. See my Seven Hungers of the Human Family (Washington, D.C.: United States Catholic Conference, 1976) 8–15, especially 11–13. See Time 113, no. 23 (June 4, 1979) 24. George Higgins, “The Problem in Preaching: Politics/What Place in Church?” Origins 2, no. 13 (Sept. 21, 1972) 213. The whole article (207, 212–16) merits reading for its wedding of the theoretical and the practical, based on the respected author’s long and varied experience. Quoted by Higgins, ibid., 216. See “The Word Made Flesh Today” (n. 24 above) 125. Quoted by Joel Porte, “’I Am Not the Man You Take Me For,’” Harvard Magazine 81, no. 5 (May–June 1979) 50. This material is licensed under an Attribution-NonCommercial 4.0 International License.